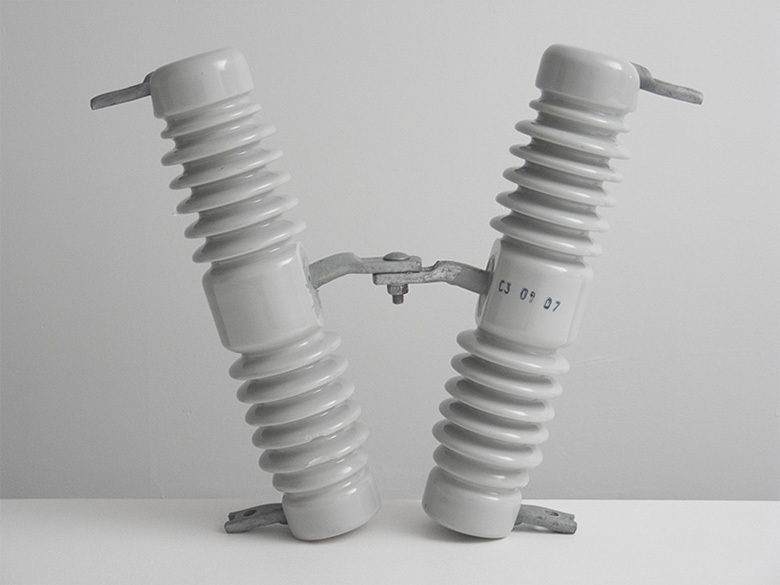 Pull | 2008 | ceramic insulators | 15 x 12 x 4 in. The parts for this piece were originally found on a loading dock in early 2007. I’ve always liked these forms for the competing quality the ribbing and ceramic suggest. I had gone through a handful of ideas on how to use them but eventually set them aside for lack of clarity. What was really happening was that I was over-thinking the matter, trying too hard to justify my reasons for liking the object. After staring at it for a while I began to strip off all the attached pieces that were hooked onto each insulator; little by little aranging them in ways that evoked a reaction in me that was greater than the sum of the parts. At one point I walked out to the street to look up at a telephone pole to get an better image of them in their normal state, which really didn’t help much. At another point I fell asleep in my chair. Once I woke up I was able to think a little clearer. I then decided to begin with just the two insulators and add pieces as needed. Nothing more was needed once I came to this arangement.